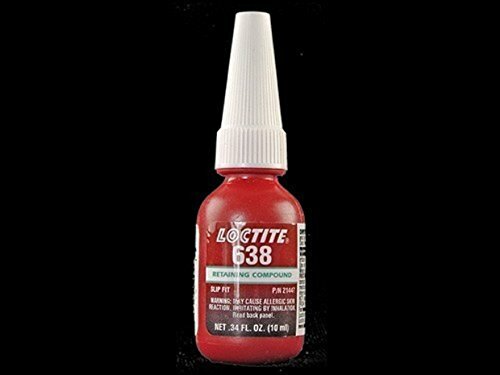 LOCTITE 638 is designed for the bonding of cylindrical fitting parts, particularly where bond gaps can approach 0.25 mm and where maximum strength at room temperature is required. The product cures when confined in the absence of air between close fitting metal surfaces and prevents loosening and leakage from shock and vibration. Typical applications include locking bushings and sleeves into housings and on shafts. LOCTITE 638 provides robust curing performance.It not only works on active metals (e.g. mild steel) but also on passive substrates such as stainless steel and plated surfaces. The product offers high temperature performance and oil tolerance. It tolerates minor surface contamination's from various oils, such as cutting, lubrication, anti-corrosion and protection fluids. Compliance: Restricted Product Vending Certified Color: Green Container Size: 10 mL Container Type: Bottle Gap Fill: 0.015" Odor: Sharp Physical Form:Liquid Specific Gravity: 1.100 Style: High Strength Type: Retaining Compound Vending Certified: Y Viscosity cP: High Product Weight:0.054 lbs. Recommended for slip fit parts with larger gaps. Exellent performance for dynamic, axial and radial loads.